HIGH Getting lost in the game. LOW Actually getting lost in the game. WTF Murdering adorable creatures to learn alien languages. 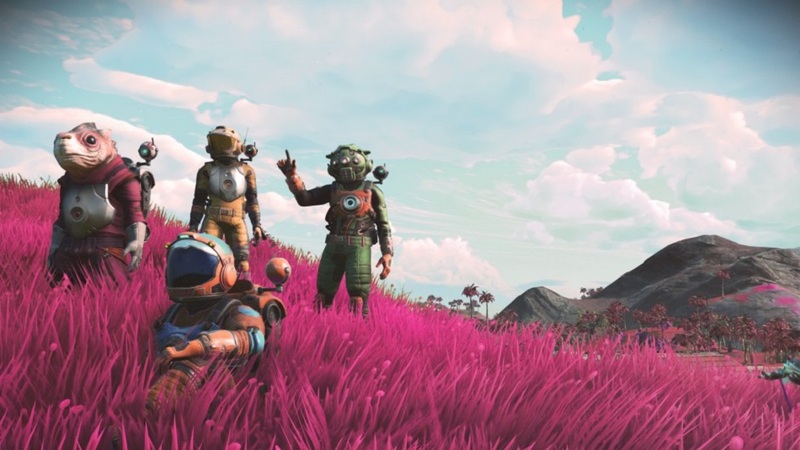 Not having played No Man’s Sky’s previous iterations, I was excited to learn that it was coming to Xbox with a multiplayer mode. I’ve mentioned before that my husband and I have a two-TV setup in our living room, and an online multiplayer game is the closest to split-screen we get most of the time. When we powered on the game and found ourselves mutually hurtling through space, the excitement was palpable. 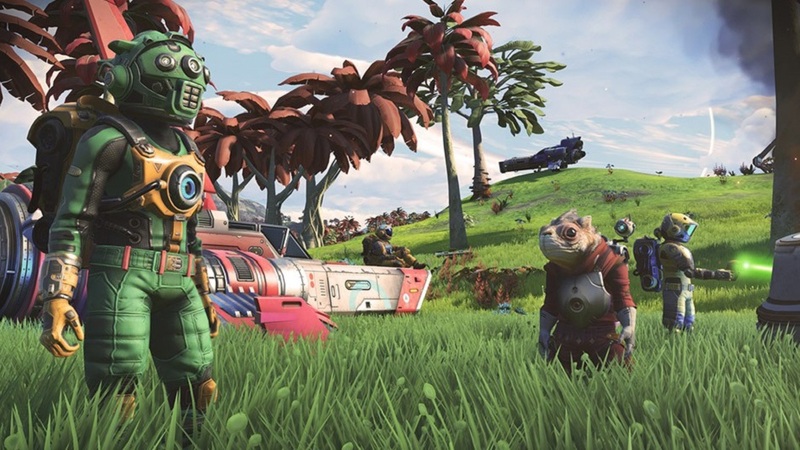 NMS: Next drops players onto a planet rife with danger from the first moment. Having apparently lost all memory of their past, the player must figure out how to activate their own technology in order to escape the attacking sentinels and the planet they’ve crash-landed on. With a huge variety of plants, rocks, creatures, and landscapes in dazzling fantasy hues, it was easy to feel drawn to exploration… at first. From my very first step on land, even after watching my husband play, I wasn’t totally sure whether the sentinels and creatures were on my side or not. They attacked when I started mining sometimes, but I couldn’t actually tell if they were protecting the land or just angry that I was disturbing their electric nap? Maybe they just heard me and thought it’d be fun to open fire? I still don’t know. Who controls them? Why are they there? Why do some planets seem not to have them? More importantly, how do I recharge my health bar? 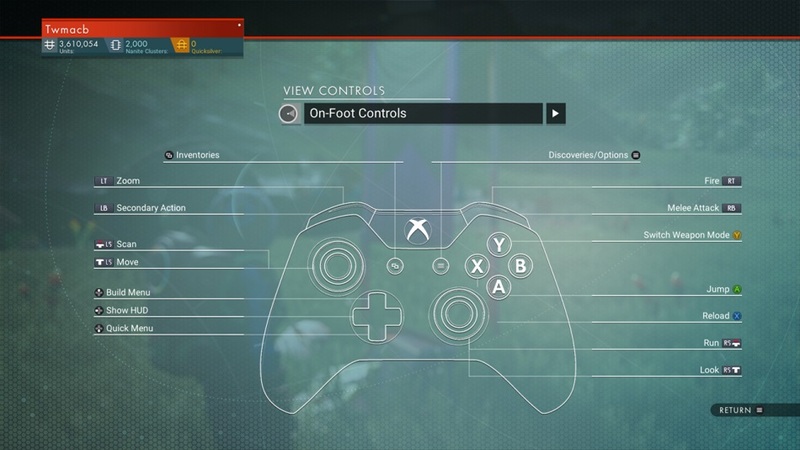 Most of NMS: Next’s controls are easy enough to figure out and I got going quickly, but not before dumping loads of a precious resource into my health without realizing I could use something simpler. I also made many other, similar mistakes. Between throwing away the good stuff and dealing with a severe lack of inventory slots, the feeling of ‘me against the universe’ was in full effect. Lots of other things also made the experience more frustrating than it needed to be — things things like knowing that technology can be installed in the inventory to save space before discovering that it can’t be uninstalled meant ambiguity between “buy this spaceship for lots of money even though it’s broken and a terrible investment” versus “take apart this crappy spaceship to get some great resources!” Yes, I might be a little salty that I bought a junker. Of course, engaging in the multiplayer made the learning come much faster. Exploring the unknown was more exciting alongside someone to be excited with, whether that was my husband in the same room on his TV, or with a friend online and elsewhere in the real world. 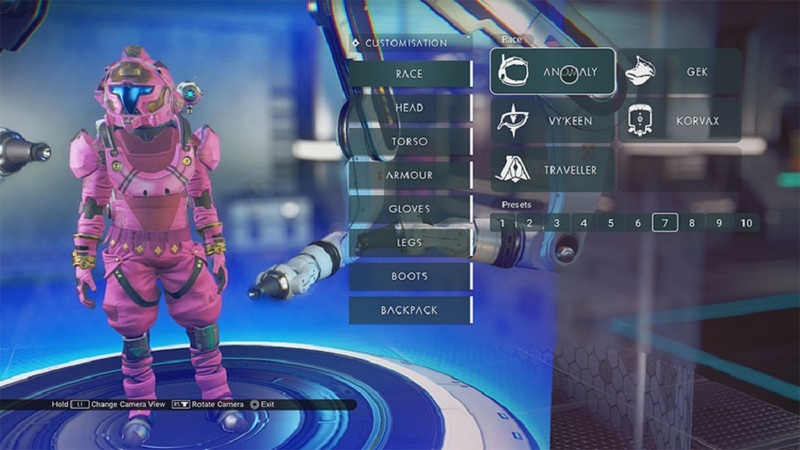 Players are able to share bases and tools like computers and analyzers, as can also trade or share resources from mining. I wanted to see the option to carpool (shippool? ), as the resources required for flight get used up fast, but it proved helpful to be in separate ships when a friend was being attacked and we were able to coordinate attacks. The possibilities, like the universe itself, are endless. However, it was often easy to forget that I was playing with anybody else, and I often lost track of where the other person was or what they were doing. On one hand, this was nice because it felt like the dream-come-true RPG where everybody is living their own role, regardless of what others are doing. On the other, it made me wonder that the point of playing together at all was. As nice as some of the benefits like trading and mining were, it really boiled down to just having someone to talk to. Other issues I had were more technically-oriented. 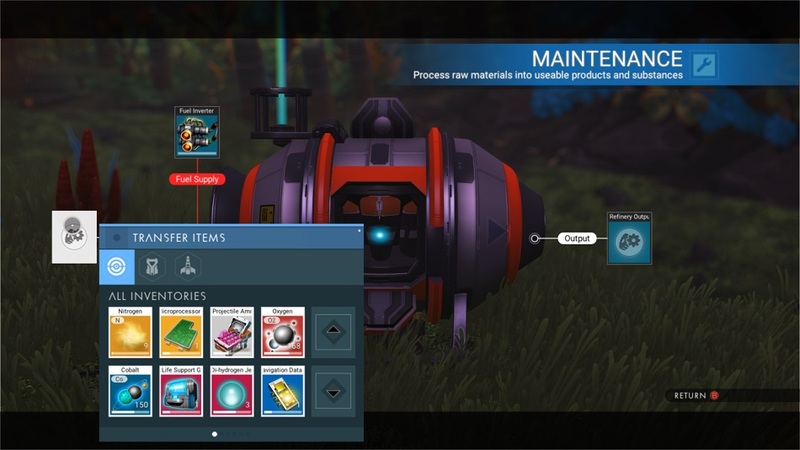 The in-game lore of No Man’s Sky is vast and features graves, monoliths, abandoned relics, and a variety of alien languages that all point to a deeper and richer history than the player knows about, but it was frustrating to find that a bug apparently causes relics and other resources to disappear if a mining tool is used too close to their location. Also, metal deposits and other large minable sources are marked in the player’s scanning mode on foot but not during flight, and markers signaling these ores don’t disappear, even when the resource has been completely mined out. Disclosures: Approximately 4 hours of play were devoted to the single-player mode, and the game was not completed. Approximately 12 hours of play were spent in multiplayer modes. Approximately 3 hours of observation were devoted to watching my husband play single-player mode. Parents: According to the ESRB, this game is rated Teen and contains Fantasy Violence. The game allows the player to kill animals and engage in space battles. There are some disturbing descriptions of tiny aliens invading the player character’s body, eating their brain, etc., but no graphics accompany these descriptions. Deaf & Hard of Hearing Gamers: All information is provided in text form and by default any voice acting has captions turned on. The game is fully playable without sound. Text size cannot be adjusted.